I’ve been thinking about simplicity lately. The idea that an image can be simple but not easy has grabbed my attention. The difference between simple and complex isn’t easy to understand. This is one reason why text leveling does not work for measuring the difficulty of a text. Text leveling measures what it is designed to measure – the length of words, sentences, and paragraphs; the commonality of words and punctuation used to construct the sentences. Text leveling programs measure these factors accurately, but what these measures miss is what I have begun referring to as the “cognitive-aesthetic” work that readers do when reading. That is why Hemingway ‘s The Sun Also Rises has a lower Lexile score than Atwater’s Mr. Popper’s Penguins (read the New Republic’s article here) that means Hemingway’s language might be simpler but the story is not. The issue is NOT that the measures are wrong, it is that they are being used incorrectly. It is as if I asked for a vegetable peeler and got a hammer. The hammer is designed to do a job, and in the right hands it can do those jobs well. But take a hammer to a ripe mango and all you have is a big mess and that is what these measures are doing for classroom reading – making a giant mess. 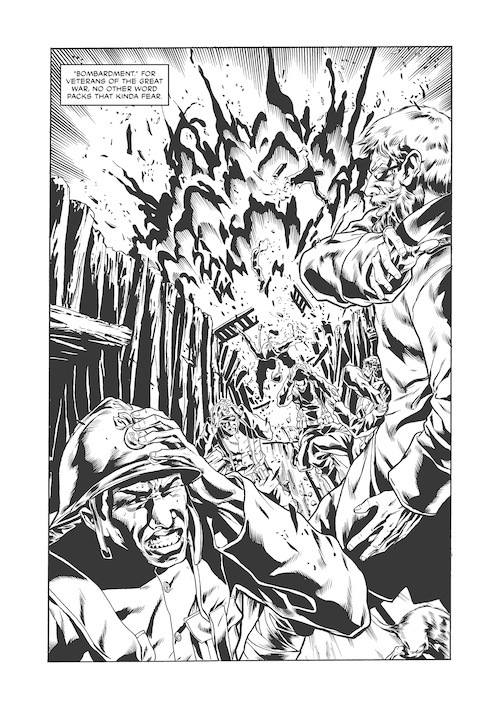 And, when utilized on graphic novels, comics and even informational books with an abundance of images, things go very wrong, very quickly. And so I have been thinking about cognitive-aesthetic comprehension. I began looking at books that express great emotions – an abstract and complex construct – with little detail and little or no color. Mo Willems is an expert on the use of muted colors, simple lines, and few details to convey great emotional range and depth in a character. How else can he take us from a happy-go-lucky Pigeon to a despondent Pigeon? Willems changes the “pupil” location, the neck, the tail, and the wings. We, the reader, read into these changes and interpret the emotional context of the character. Andy R unton shows us a depressed and worried Owly by manipulating similar aspects of the bird – especially the eyes. Using the same downcast pupils in large, white orbits he is cueing the reader to interpret worry or sadness or, even, depression. But what about artists who don’t use these kinds of large, rounded eyes? How do they provide the reader with cues to the emotional life of a character? Marjane Satrapi’s memoir Persepolis uses deceptively simple, solidly inked illustrations. 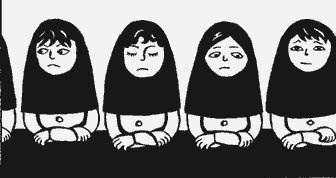 Typical of the book is this illustration of Marjane and her friends as they are made to wear veils for the first time in their lives. Satrapi provides the reader with a view of the changing world these girls are experiencing during Iran’s religious revolution. She uses a few details to delineate girls from one another, including their eyes, a bit of hair on the forehead, and a single line for the mouth and yet we see a range of emotions from comfort or acceptance to worry and resignation. In Bluffton, Matt Phelan gives us a character who is known for his deadpan expression. Buster Keaton’s youthful face is shown with almost no expressive lines, slightly raised eyebrows, and like Satrapi’s young girls, a single line for a mouth. But, somehow I look at that face and wonder at the depth of character that is going on behind those eyes. The lack of color is not the most striking aspect of these images – instead it is the abstractness that I actually forget about. Even without color and in only two dimensions, the human face is a complex set of lines and angles. 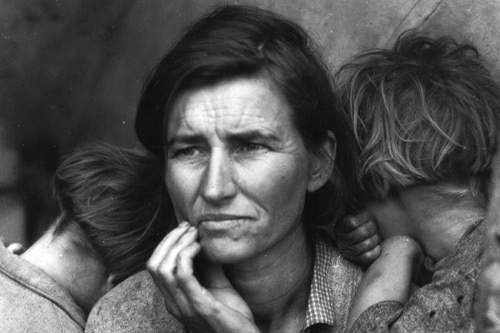 Dorothea Lange’s photos capture the depth of human emotions without the use of color, as in her famous photo Migrant Mother, Nipomo, California. Although we have to work to comprehend the emotions the photo is a realistic depiction of a human face rendered into a two-dimensional image. What amazes me, as a reader and a scholar, is the ways highly abstract faces emote such strong responses without the details that would make them realistic. The Pigeons happiness and sadness is obvious. Keaton’s emotionless face gives away nothing and yet I interpret it as having much to reveal if only given a chance. This use of highly abstract images can create characters that we as readers work to understand. But, and this is the part I am still thinking about, why are we compelled to do that work? The work the reader undertakes – to interpret a simple set of lines into a meaning of emotion, thought, an personality – is not easy and in fact the work is often far from frivolous. I was off to a good start with this blog. It felt good to put my heard-learned knowledge to something that might be useful to actual teachers. I was getting good feedback, from colleagues and from perfectly nice strangers. All of the things bloggers want. I have to say that a lot when literacy people start asking very good questions, as they are want to do. 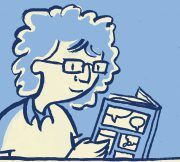 The reason I say “I don’t know” so often is because there is not a lot of research on the cognitive activity involved in reading graphic novels and comics. There is one thing that I can say. More and more emphasis on younger and younger children reading and gleaning information from non-narrative, informational texts means we had better figure this stuff out. The Common Core State Standards don’t call for reading graphic novels until the 5th grade and then they drop off the CCSS around grade 7. I can’t explain that either. 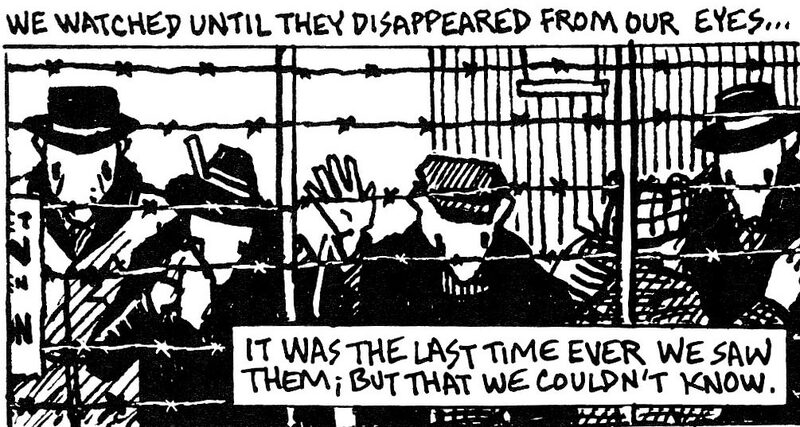 I went in search of graphic novels for young readers. I love the Owly series by Andy Runton. 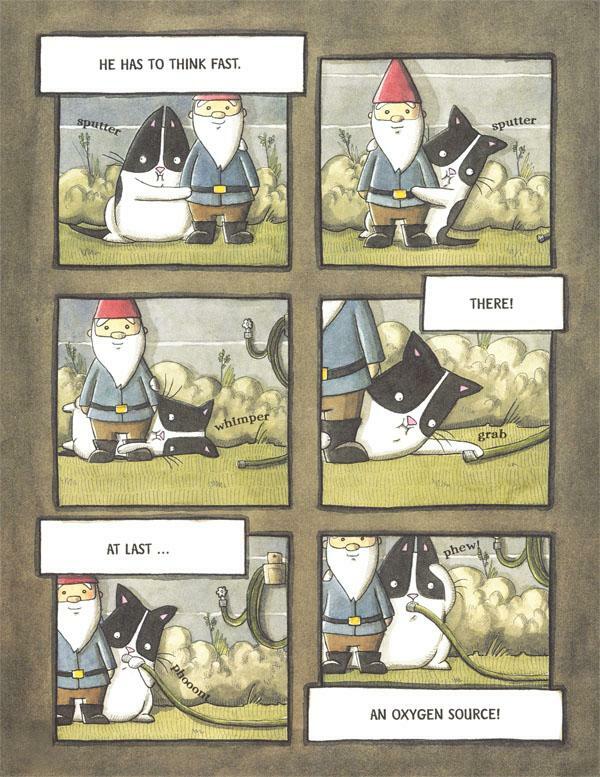 It is a fabulous wordless stories. But I wanted to know what was available for readers who are just getting their feet wet and working towards print automaticity – when reading means following the expected pattern of left to right and top to bottom that English requires. I went to my local library, talked to one librarian who was not at all interested in me or my work because he “just doesn’t get that whole comics thing”. I went to another librarian, she had some suggestions but I think she got them directly from The HornBook, which means she is reading trade journals about graphic novels, but not the actual books. I can say that because she responded to my questions with, “Yeah, I don’t actually read them”. Then I saw a kid perusing the graphic novel shelves. I watched him for a while. He was opening books, flipping through them, pausing and putting them back. He put Cardboard on his stack, put back a couple of books that weren’t very good, paused to read a good chunk of Foiled by Jane Yolan and Mike Cavallero, then he put both Foiled and Foiled Again on his stack to be checked out. A women, who turned out to be his mom, came by and asked if he was ready to go. I took my chance and asked her if it was Ok if I talked to her son, I handed her my official looking Boston University business card, and gave her my 30 second dissertation explanation. She said sure and stood near us, which was fine by me. Harold, I’ll call him Harold because he looks nothing like a kid named Harold, is 12. I chatted with him for a few minutes. He’s been reading graphic novels for a while. He’s a DC man and likes a lot of the reboot, especially the new Spider Man. He’s not too keen on Batman. 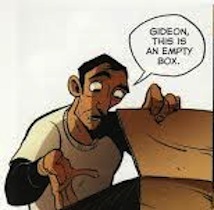 We talked graphic novels, I suggested a few, especially the Olympians series by George O’Connor. We established mutual credibility and I moved on to what I really needed advise about. Turns out Greg (He really wasn’t a Harold) liked being asked for help by an adult with a business card (I gave him one, too). After I explained what I was looking for, he pointed out the BINKY series by Ashley Spires, published by Kids Can Press. I got way too excited and geeky and started talking about publishers, Scaredy Squirrel (aslo published by Kids Can Press), fonts and white space. My cool-adult cred was totally blown and Hank (I really should have asked his name) and his mom took off. I checked out all the Binky bo oks (I found 4, there is a 5th coming out in September), and read them several times. I like them a lot. They appeal to my sense of the absurdity of taking oneself seriously. Plus, there are fart jokes. 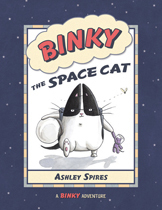 Binky is a house cat who is in charge of protecting his space station (the house) from aliens (all manner of flying and stinging bugs). 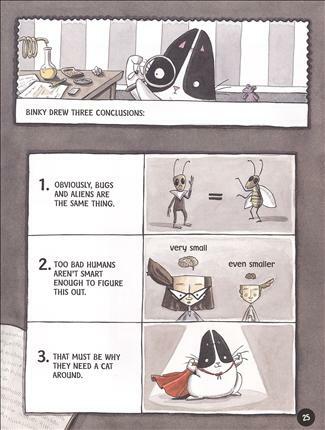 The books have a great dual narrative (much like the Bad Kitty books by Nick Bruel). 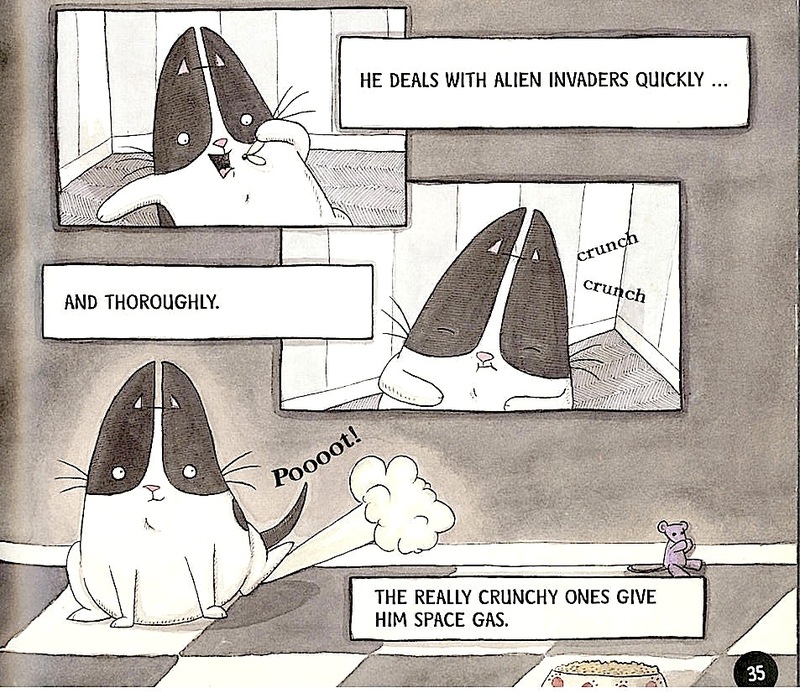 Binky’s space station narrative, in which he is a highly trained member of F.U.R.S.T (Felines of the Universe Ready for Space Travel) stand in sharp contract to the reality that the readers understands, in which Binky is a total nut-job of a cat. The illustrations work on these levels perfectly, allowing the reader to understand the cues Binky uses to come to the completely wrong conclusion about the world. 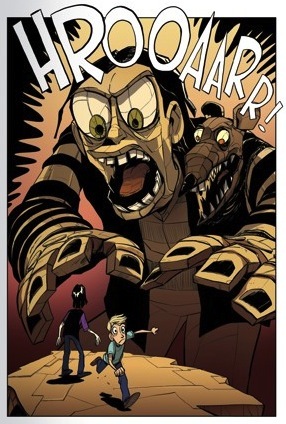 Also, did I mention the fart jokes? In general the regularity of the panels, and the action oriented transitions work to provide scaffolding of the sequencing of the story for young readers. In addition, the colors are mostly muted with small dashes of vibrant color. But, and there is always a but, I don’t think the reading level, the actual written words on the page, are designed for young readers. I wanted to see what others thought about Binky’s reading level and soon discovered that no one has developed a good measure of graphic novel reading levels (and there is another project). Here is what the experts say about Binky’s reading levels. The thing is, these reading levels (including the Lexiles) range from grade 1 to grade 5, which is a wide range! 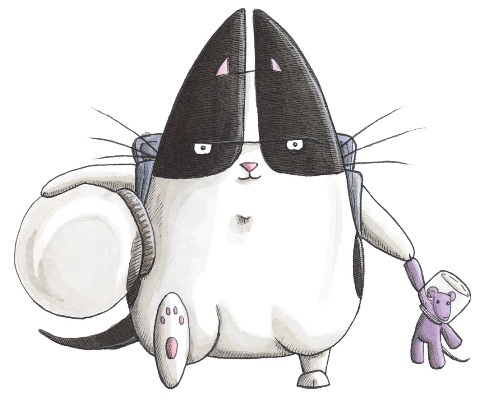 There are many complex words and phrases like “collecting specimens” (Binky to The Rescue, p. 19) and “caught unlawfully reading” (Binky The Space Cat, p. 5). I wonder how many 5 year olds could figure out those phrases. I want to return to the question that began this post. 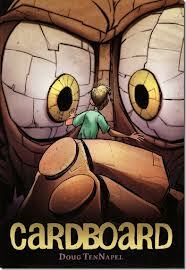 What about graphic novels for very young readers? Do these books help? Do they hinder? And, again, I have to say I don’t know. I know there are lots of lots of questions left to answer. I’ve been thinking about how to develop a measure or rubric or system to communicate reading levels but … I don’t know.